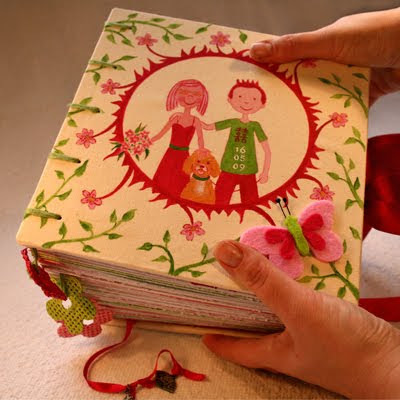 Paperfection's Art & Craft: A Wedding Guest Album for Allie and Scott: Widest Book Ever! 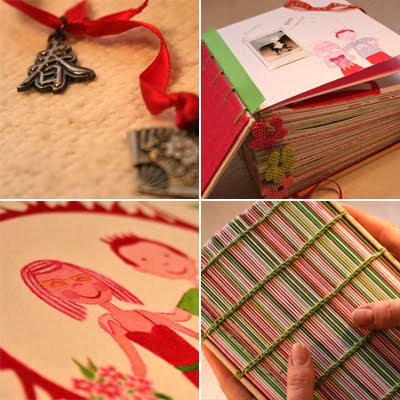 A Wedding Guest Album for Allie and Scott: Widest Book Ever! 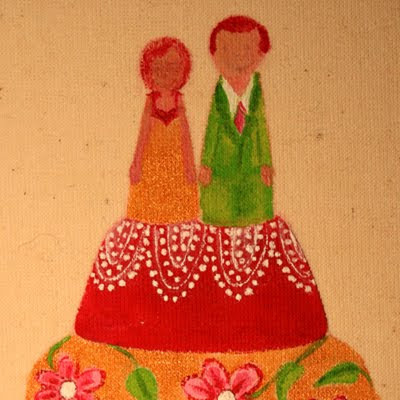 It's been a big project and it has been completed... a personalized wedding guest book for Allie and Scott in the US. 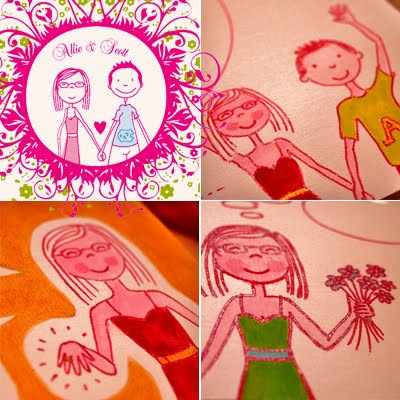 The style and colours are based on the couple's wedding invitations, by Holly from http://www.teardropweddings.com/ - gorgeous and fun work (top left)! Every single page was individually decorated... ... and used as place cards at the dinner table. Each guest wrote their wishes for the bride and groom on their personal spreads. These were sent back to me to bind into the final book. 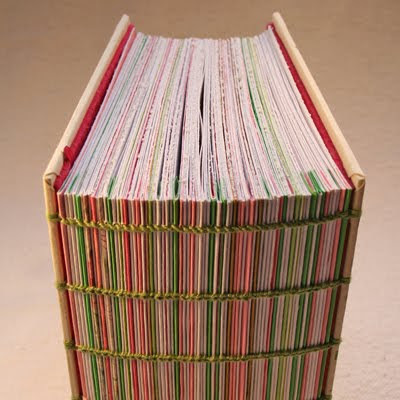 This presented a bit of a challenge, because if each guest would fill in a four-page spread, I could no longer fold the pages into signatures and bind those into a book. Instead, I would have to bind each and every spread separately. 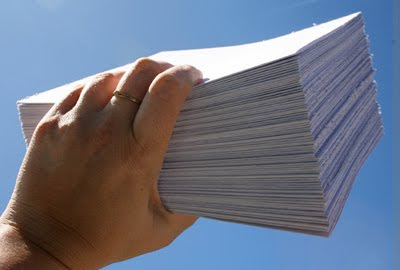 And seventy spreads of heavy-weight paper were already this big a pile! I had no idea how it would turn out, but it worked! I even included spacers to make the spine extra wide. That way, after A&S stick in all the photos, the covers will level out more or less horizontally. With a spine of 15 cm (5.9") the book is almost a cube. My widest book ever. So far, because now I'd love to stretch it even further and find out what the limits are... Will keep you posted on this one! And Allie and Scott? May they live happily ever after! very very creative! It is sure a heart stealer. I love the way your make the illustrations. That is gorgeous! What an idea for a wedding book... wow. Beautiful work! WOW! That looks like it took a TON of work! 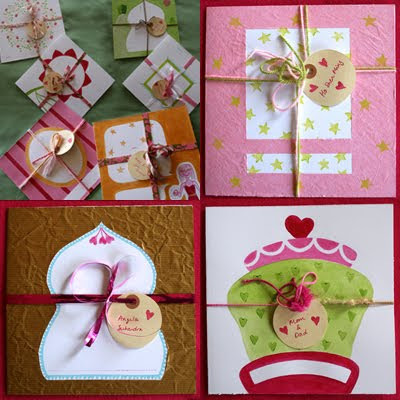 It is such a wonderful and long lasting idea! Beautiful! Oh wow! Never seen such think book! :) Amazing work done! And the idea is really nice. Wow! 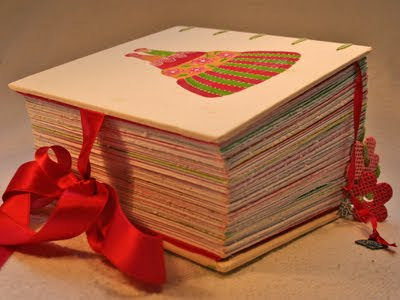 I love this super cute chunk book! What a wonderful project! Great work and idea. They will be so happy with it, I'm sure! Allie and Scott ARE living happily ever after: they expect a little one soon! can't wait to show it off!! !